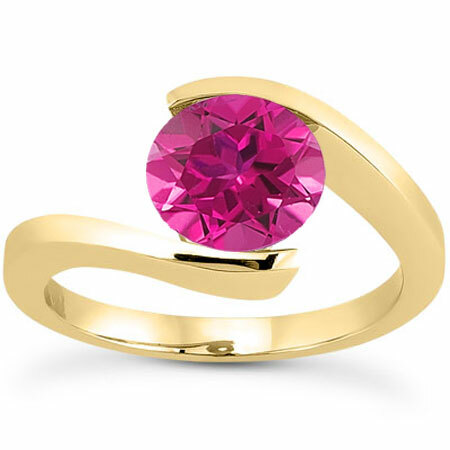 Add an extra twist to your traditional solitare gemstone ring with this tension set 1 carat AA rated pink topaz solitaire ring from Apples of Gold Jewelry! Set in 14K yellow gold, the pink topaz ring will remind you of the beautiful, fluffy clouds during a sunset or your favorite cotton candy at the fair! The round, 6.5mmm authentic stone is held in place by the two ends of the band, completing the circle of the ring and giving it an effect that will capture your heart! We guarantee our Tension Set 1 Carat Pink Topaz Solitaire Ring, 14K Yellow Gold to be high quality, authentic jewelry, as described above.